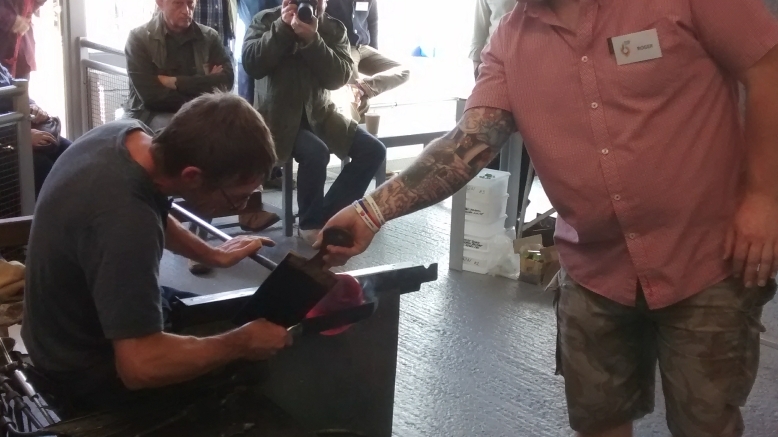 The Collector's Day was the official opening of the new studio at Arreton Barns, even though the studio had been producing glass for about six months. Ron Wheeler was the master of ceremonies. 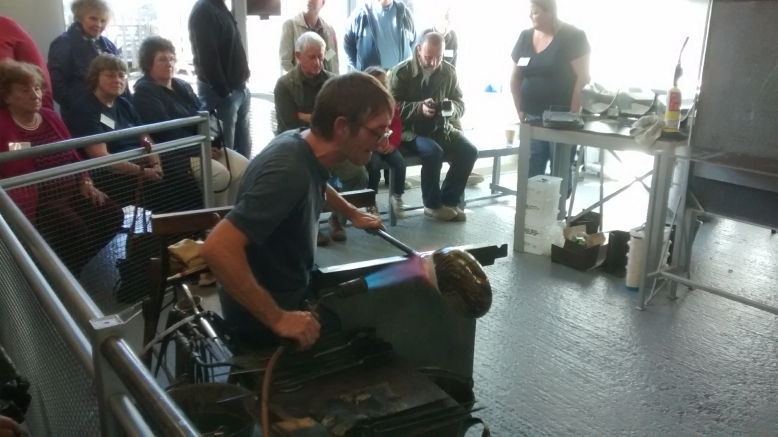 The programme started with Mark Hill officially opening the studio. 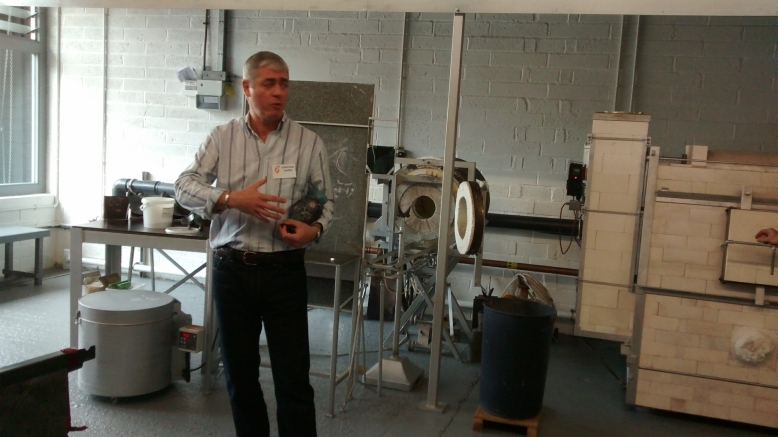 Jonathan Harris then told us about his association with the studio from 1987 when he finished college. He showed us the Liberty pieces he designed at that time and some of his recent and spectacular cameo pieces, including a series of four pieces he calls Seasons designed for Asprey. 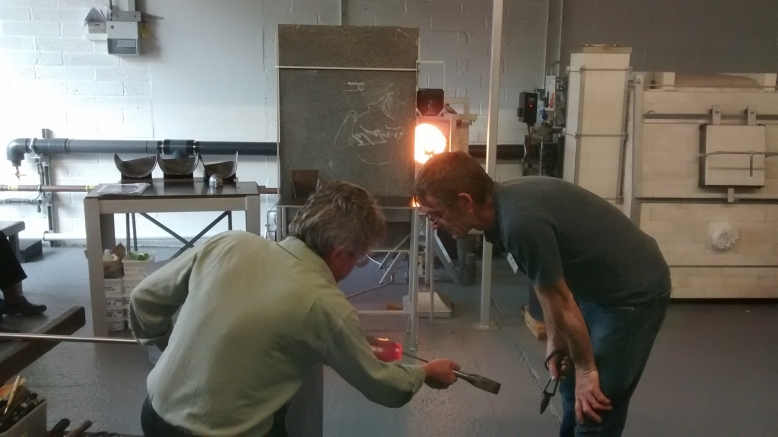 Then William Walker, the co-designer of Azurene, which really set up the early studio on the way to success, demonstrated making a black Azurene jug. Apparently William hadn't seen Timothy Harris since he was a child. Tim helped making the jug. 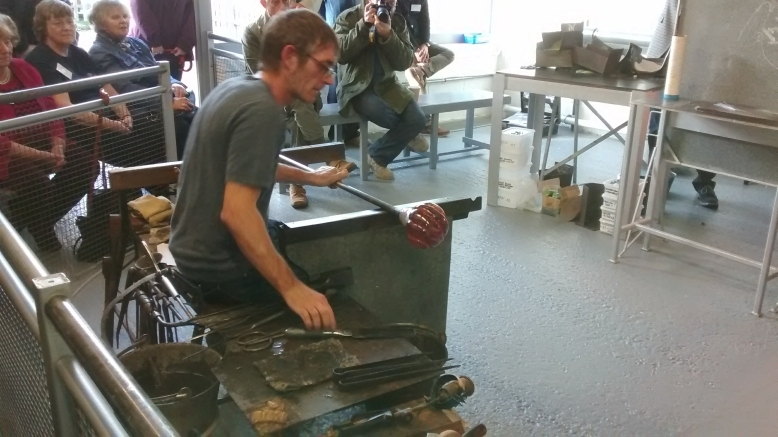 William followed by making one of his iconic landscape vases. 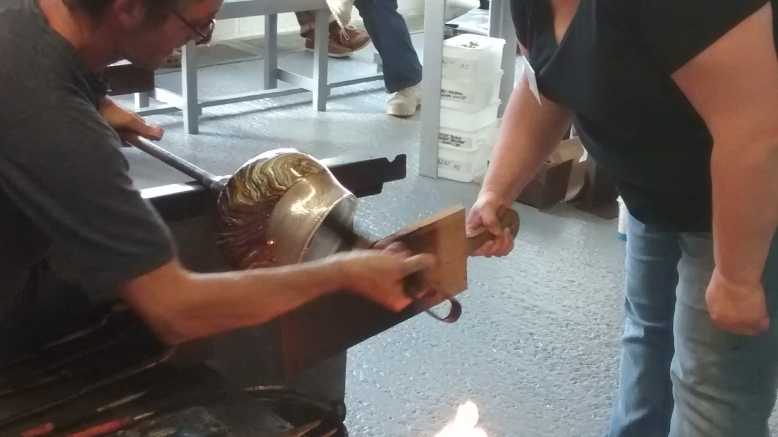 Tim followed by demonstrated the making a small graal vase, just before lunch. 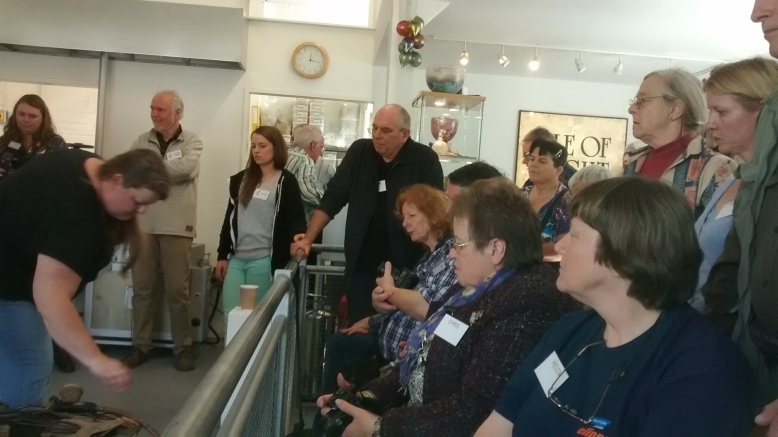 About half of the 30 or so collectors at the event had lunch together at the Dairyman's Daughter pub at Arreton Barns. 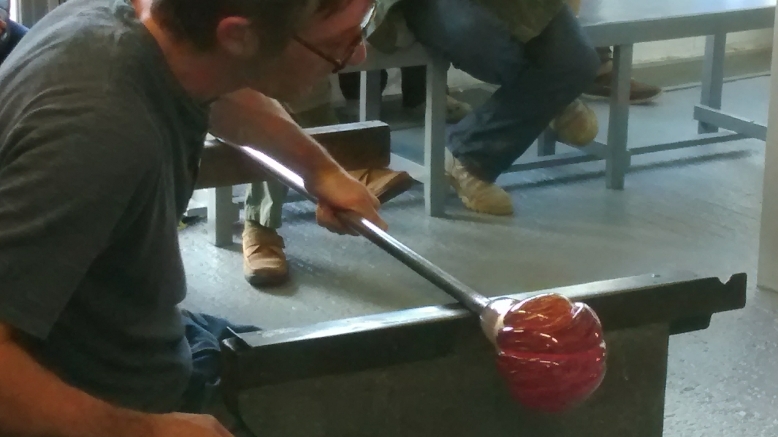 The afternoon was spent watching Tim make the special collector's day piece, a huge bag vase in the new design called Stratum 'Arreton Valley'. It was an incredibly complex process. 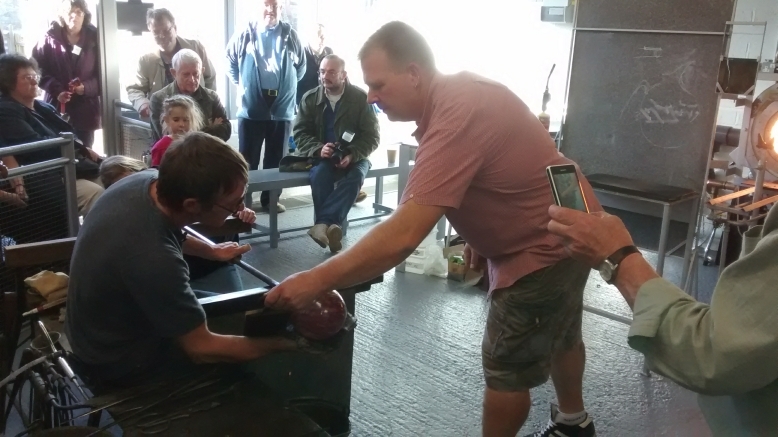 All the collectors were fascinated, and Jonathan and William were just as riveted at Tim's skill. They were taking lots of pictures themselves. 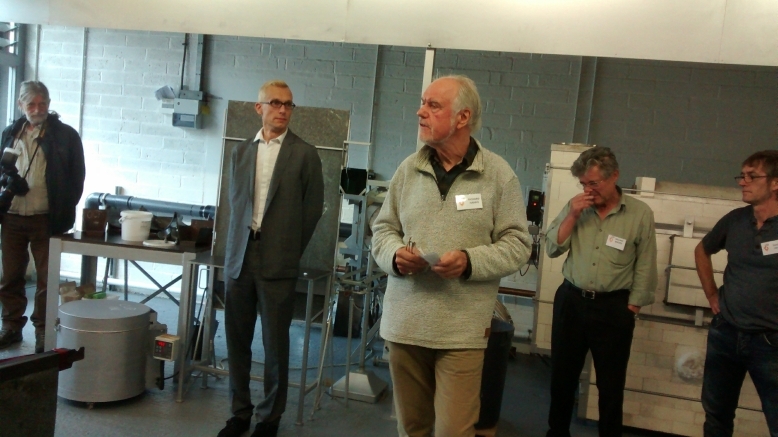 Dr Richard I Harris, Managing Director, Isle of Wight Studio Glass (centre), welcoming everyone to the event. 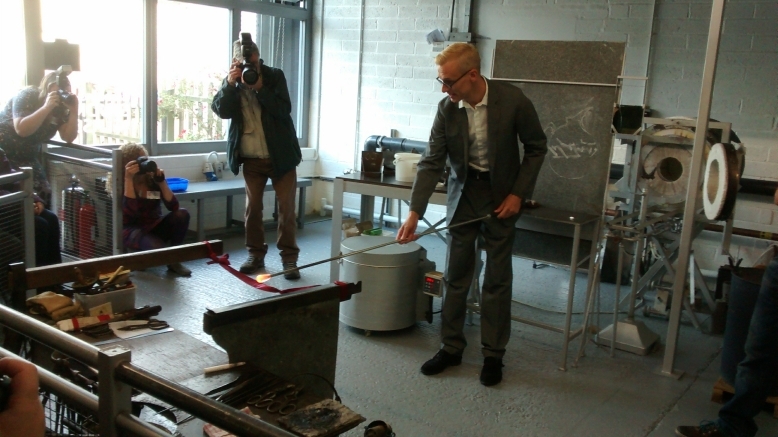 Mark Hill burning the ceremonial tape to officially open the studio. 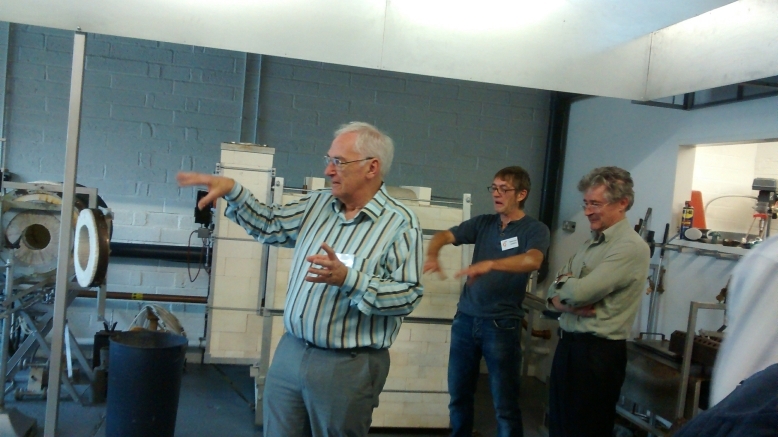 Ron Wheeler (left) as Master of Ceremonies, with Timothy Harris 'doing a Ron impression' behind. 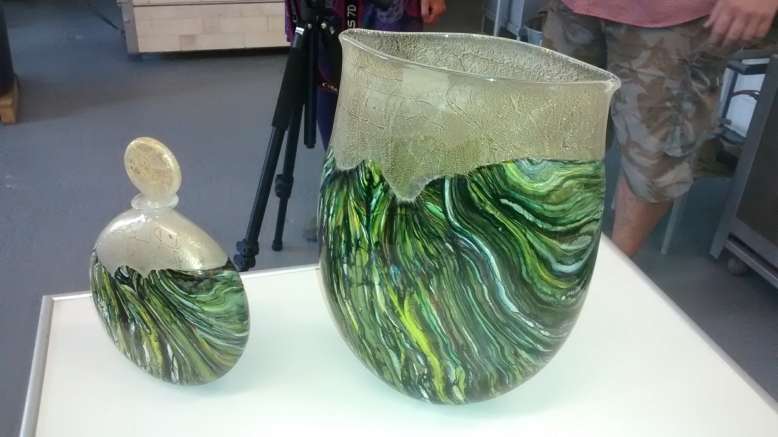 Jonathan Harris talking about his early associations with the studio, holding an example of his cameo vases. 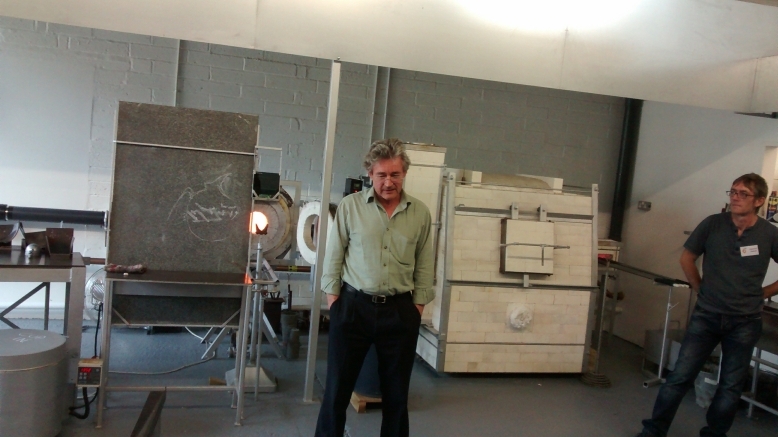 William Walker, co-designer of Azurene, reminiscing about the early 1970s at the studio. 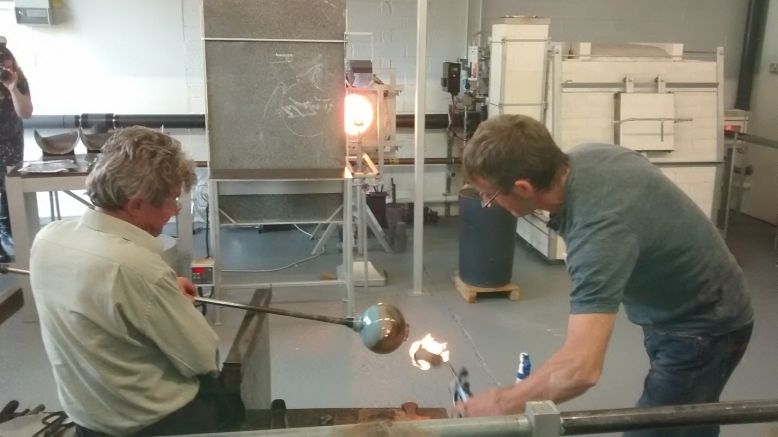 William starting to make an Azurene jug. The Azurene jug is taking shape. The Azurene jug is nearly complete. 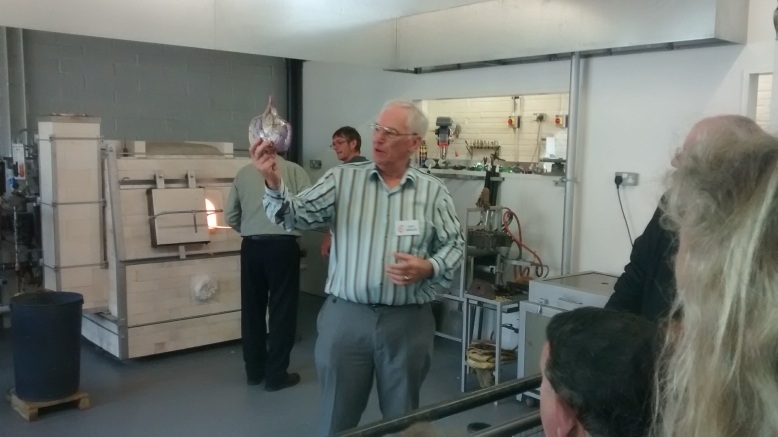 Ron showing an example of the iconic Azurene fish vase. 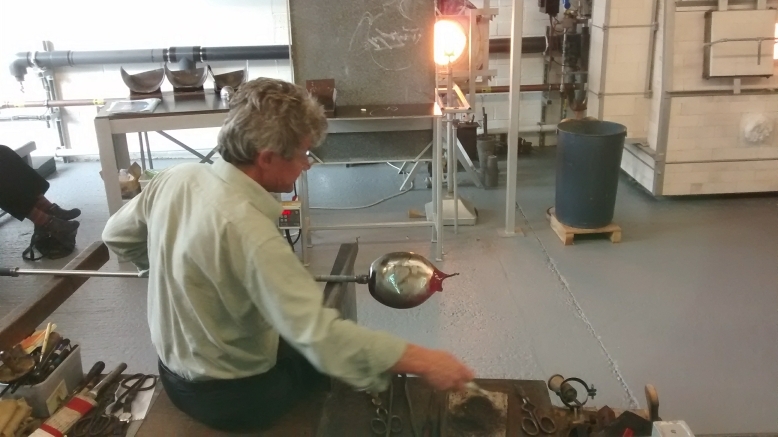 William Walker making one of his famous landscape vases. 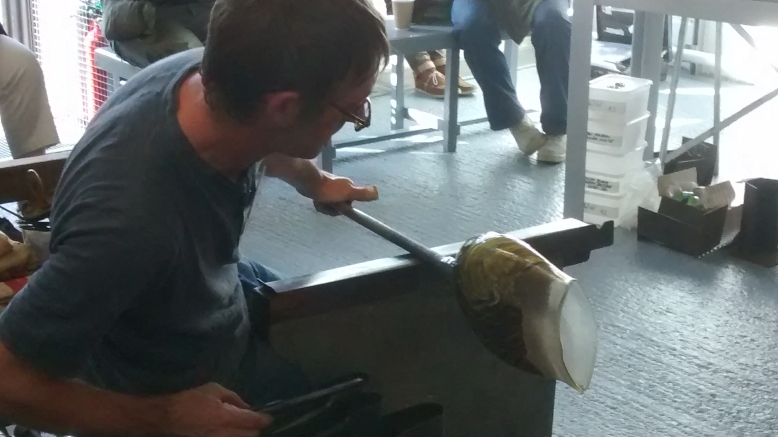 Tim helping William as his landscape vase nears completion. 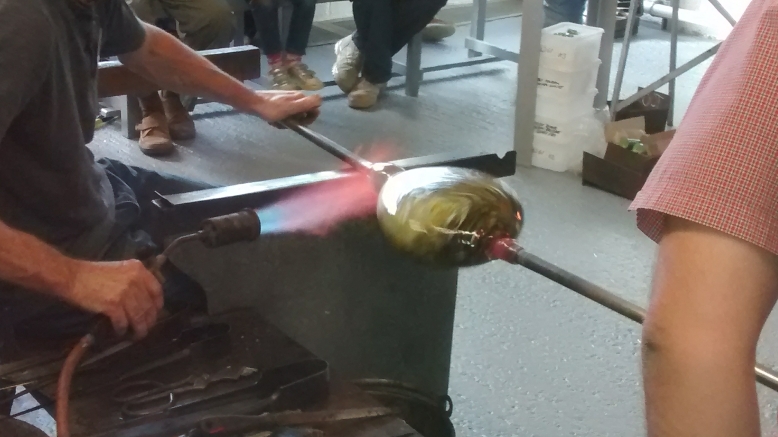 Transferring the landscape vase to a punty rod to allow the vase opening to be shaped once detached at the other end. 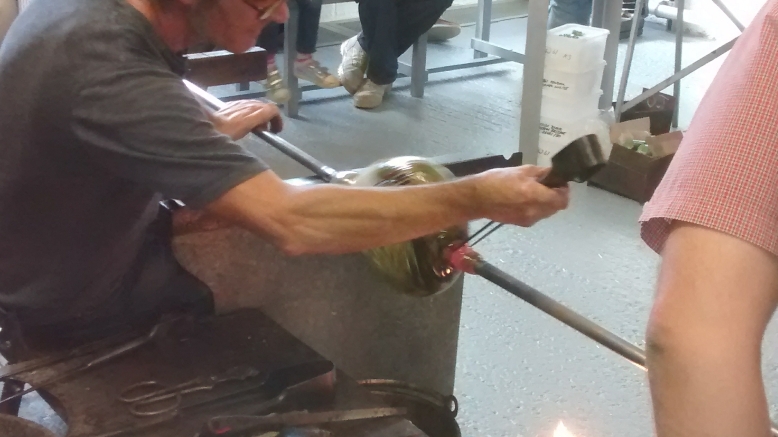 Tim finishing off a small graal vase. Left to right: William Walker; Roger Pike; photographer; Richard Harris; Ron Wheeler; Ffleur Harris, Tim's daughter; Jonathan Harris behind. Claire Hockingde-Noffki is sorting tools at the workstation. 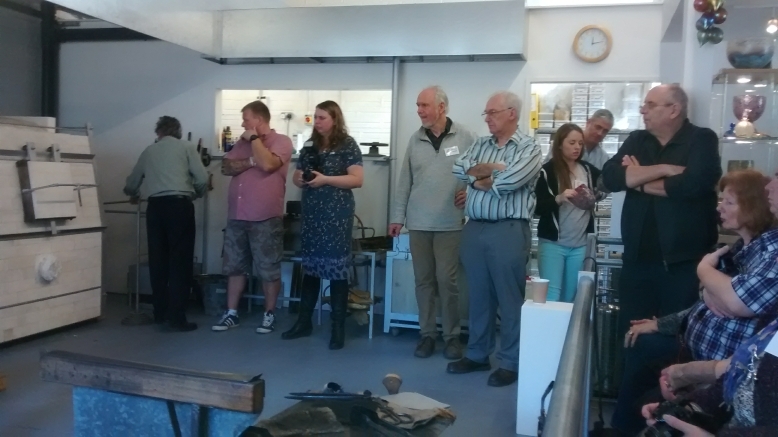 The collectors are enthralled by the glass making. 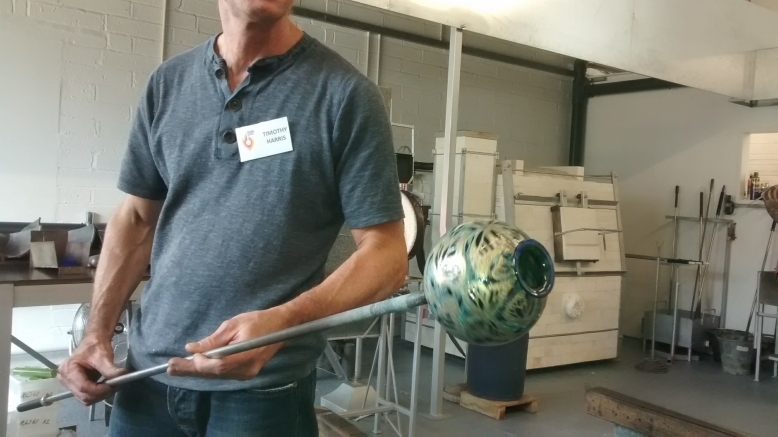 Tim showing off the small graal vase he has just completed. The special collector's pieces especially made for the event. 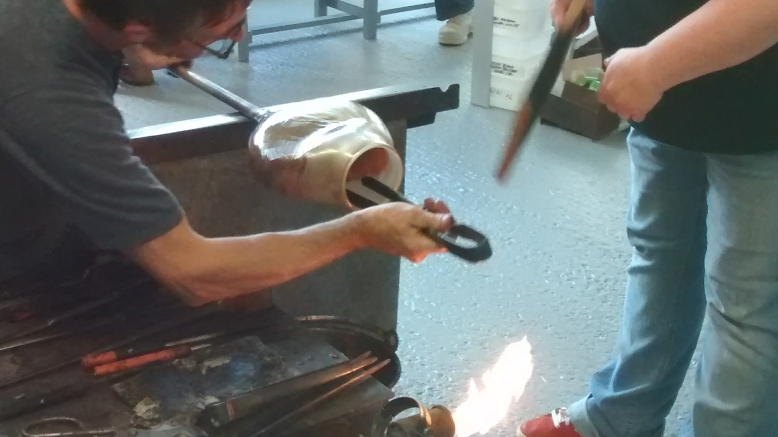 In the following pictures the bag vase is made. 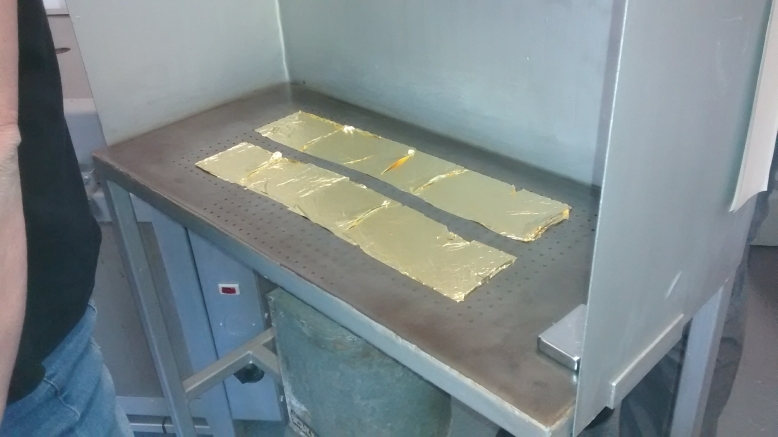 Special table with suction to hold gold foil in place. The foil is so light it would fly away otherwise. 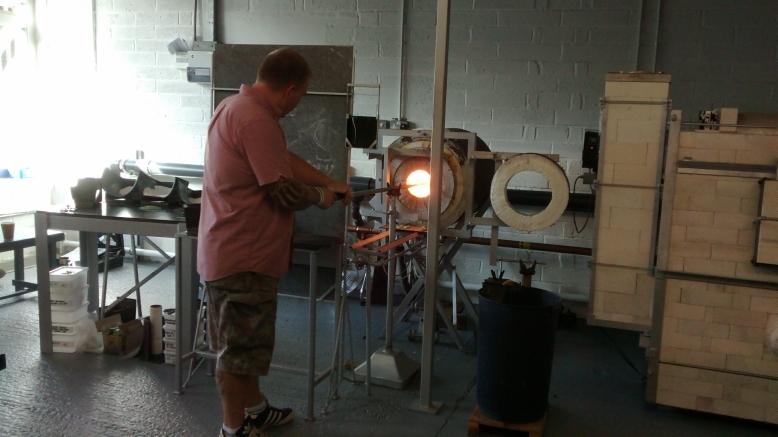 Tim has just rolled the glass gather to attach the gold foil. 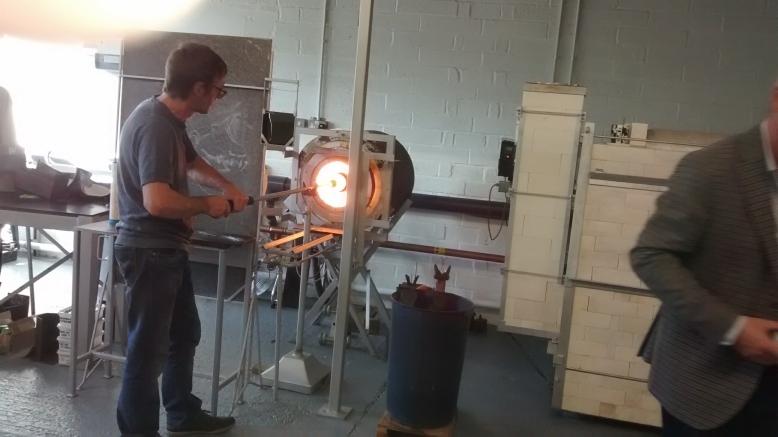 Reheating the glass gather with the gold attached. Tim has just added colour to the gather. Roger is protecting Tim's arm from the heat using a wooden paddle. 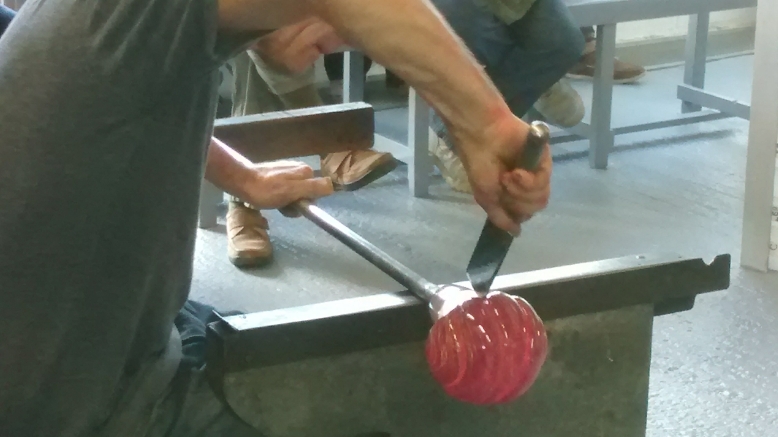 Cutting the glass blob with a knife to introduce the striping effect on the vase. Checking that everything is progressing as wanted. 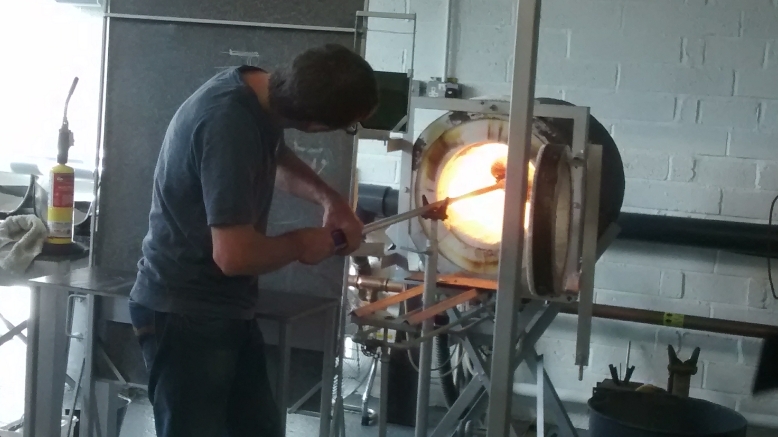 Checking once again that everything is OK.
Claire is behind Tim is blowing air into the glass to enlarge it. 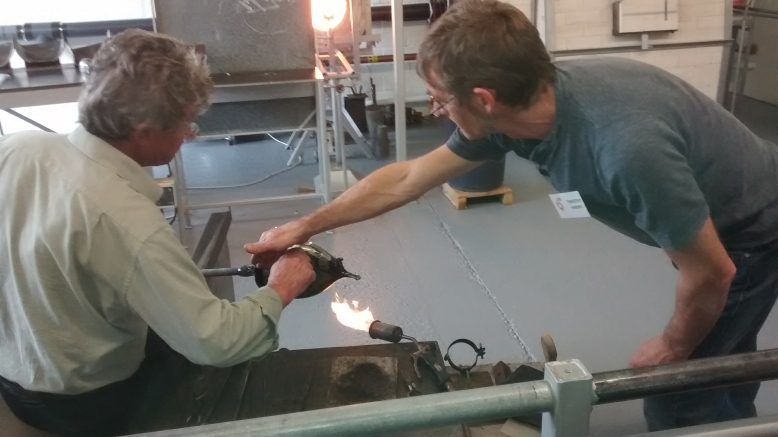 Much later in producing the vase, after many complicated operations. 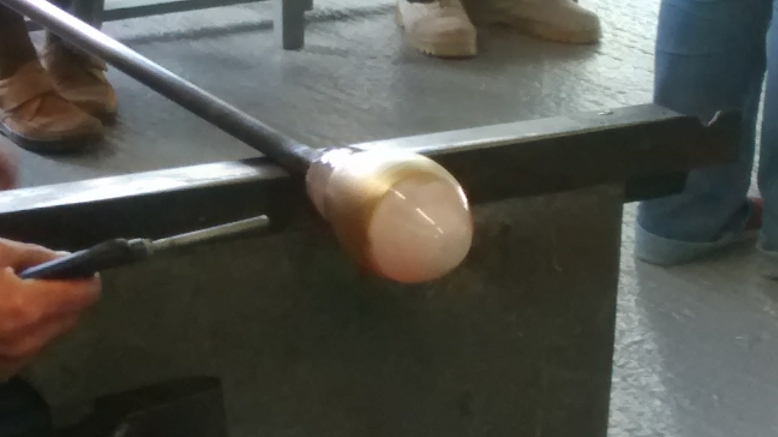 Getting ready to attach the punty rod on a small glob of glass. 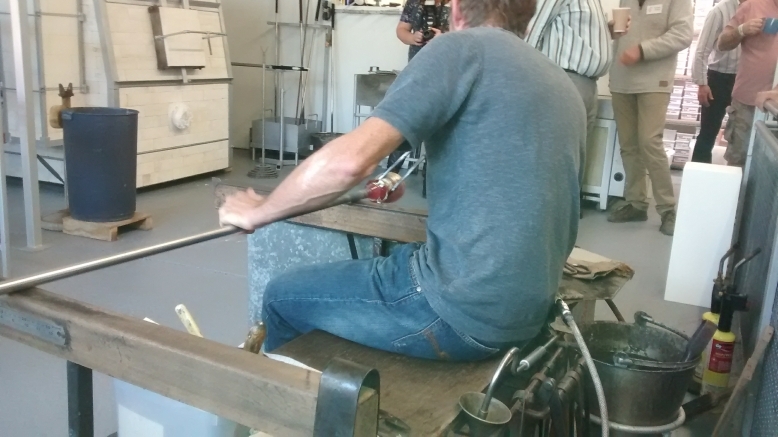 Attaching the punty rod to allow the vase to be transferred to it. 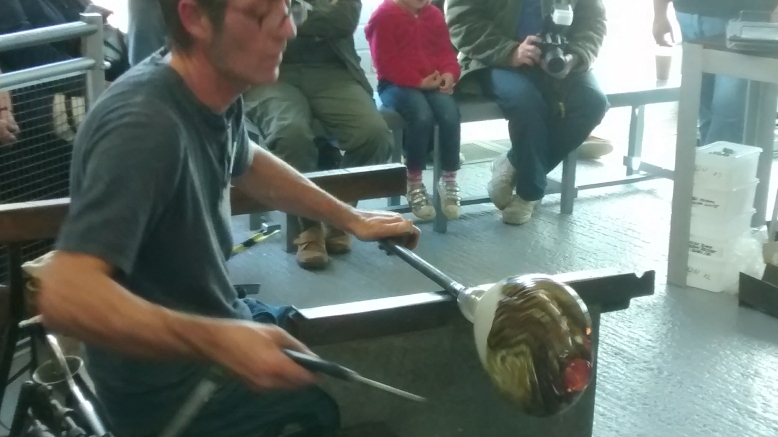 Heating what will be the open end of the vase before detaching it at that end. 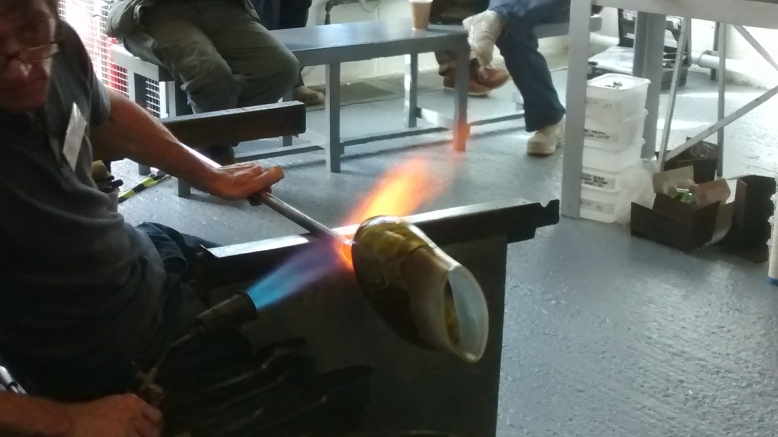 Initial shaping of the open end of the vase. The opening of the vase is now near to what is wanted. 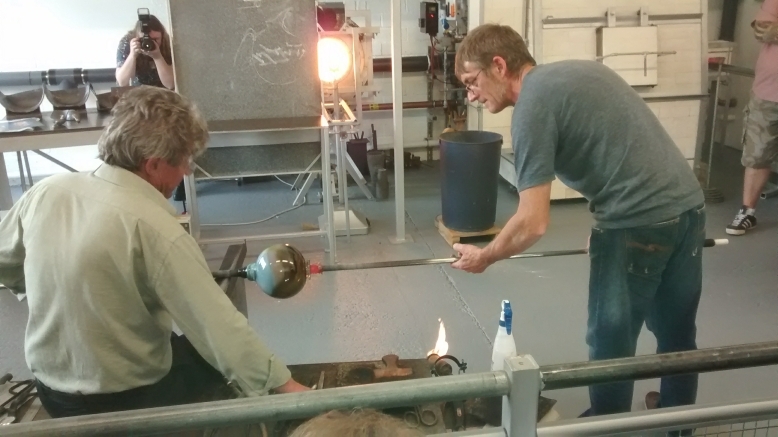 Reheating the completed piece in the furnace. It's done! 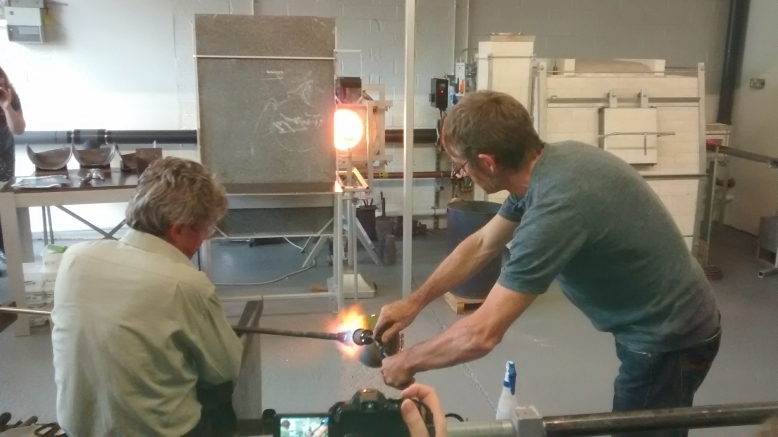 Just need to detach the vase and place it in the annealing oven.